As a way to celebrate all the goodness of Earth, we are announcing an image collection that features the 50 Most Beautiful Places. Starting at number 50 we have the Cliffs of Moher, which are located on the edge of southwestern Ireland. The cliffs derive their title from a former watchtower named Moher, possibly thought to be used as a lookout post during the Napoleonic Wars in the early 1800's. The cliffs are measured to be 214 meters (702 feet) tall at their highest point and provide an overlooking view of the Atlantic Ocean. The entire cliff edge extends for nearly 5 miles down the coast and attracts more than a million people per year with its shear rock face, historical relevance, and beautiful scenic views. The jagged layers of the cliffs are made of 300 million year old deposits of shale, sandstone, and siltstone. The sandstone is extremely susceptible to coastal erosion from the ocean currents and changing tides. This erosion over time has given the cliffs their famous texture and form. Eventually the rocks that fall away from the cliff face deteriorate from the ocean waves at the bottom but sometimes the debris that falls from the cliffs can collect together and build sea stacks or sea stumps that rise out of the ocean water. Like the famous Branaunmore Sea Stack pictured below. The cliff side is in a constant state of change from the coastal erosion and may look subtly different annually. Overall, the cliffs are a popular destination in Ireland for both tourists and locals therefore earning a spot at number 50 in our countdown of the 50 Most Beautiful Places. In thinking about the American home, the lawn outside is just as important as what is inside. This standard of "beauty" stems from the suburban movement of the 1950's where the middle class flocked from urban city life into the newly developed surrounding suburbs, searching for an escape. Suddenly it is not just about what kind of car you drive but it is the state of your lawn that ranks your social status! The outside of your new suburban home must be manicured and finished right down to the arborvitae bushes lining your recently purchased plot of land! Never taking into consideration what is good for the environment or what will keep the ecosystem of this area fresh and thriving. This monoculture lawn marks a shift in the way we think about the American home. Today we tend to use things like sod, pesticides, fertilizers, and herbicides to keep our lawns looking green. Not to mention the ridiculous amount of water it takes to keep everything looking up to snuff. One study shows that in dry places like Southern California, where there is about an average of 17 inches of rainfall per year, people choose to grow plants that need 50-60 inches of rain per year! That results in over 60% of the household water usage going directly into lawn care. Not to mention what this kind of gardening is doing to the ecosystem. There is a great phrase out there that describes the best way to handle taking care of your lawn, "garden with mother nature not against her". This is possibly the best thing to keep in mind when considering growth. One basic question to ask yourself, is it supposed to grow here? Only planting flowers, grasses, bushes etc. that are found in the area you live in is key. Sure that white Hibiscus may be beautiful, but if you don't live in Hawaii you might want to rethink it. Create natural habitats where animals and insects will be able to live and thrive. It is true what they say, the bugs are good! They may be a nuisance but in the end they will help your garden grow and promote the overall well being of your lawn. Also, keep in mind pollution, stay away from using harsh chemicals to treat your lawn. If you start to incorporate native plants within 2 years your lawn and garden will be using significantly less water with minimal upkeep. Our friends across the pond have the right idea. Check out the Native Plant Database to find local growing plants in your area today! Be sure to check out our new series of plant inspired images in our Main gallery. These 4 new images highlight the beauty of texture in nature. Recently we saw this stunning home in Kona,Hawaii, it is architecturally beautiful and surprisingly eco friendly. Completed in 2010 This home was designed by Belzberg Architects and won Interior Design Magazine's Best of The Year Award. This home is situated amongst the unique Hawaiian hard scape integrating views of volcanic mountain ranges to the east and ocean seascape to the west. Divided into a series of pods each building has an aray of roof mounted photovoltaic panels to offset the residence energy use. Dark lava stone heats the pool via solar radiation. Reclaimed teak timber from old barns and train tracks have been recycled for the exterior of the home. Coupled with stacked and cut lava rock these two materials form a historical driven medium embedded in Hawaiian ttradition. Similarly, digitally sculpted wood ceilings and screens form an abstract approach to traditional Hawaiian culture. As a whole this home has the feeling of infusing traditional elements into a contemporary dwelling. Robert Smithson's spiral jetty in the Great Salt lake of Utah stands or rather lays as the best known example of what is refered to as earth art. Smithson would call it an Earthwork. Creating art in nature with natural materials is the defining philosophy of those who follow in his footsteps. For those who've had the good fortune to follow Andy Goldsworthy's luscious serpentine stone wall as it disappears and resurfaces- diminished- from the waters of Storm King or frolic through the saffron arches of Christo's Central Park reverie have known the existential thrill of collaborating in the artistic vision of its creators, and by the very act proclaiming art to be beyond the reach of the commercial art market. Andy Goldsworthy's connection to nature is beheld in the temporal nature of many of his creations: Ice sculptures that transpire with solar fluctuations; floating floral caravans that are borne by tides to watery graves:"I think it's incredibly brave to be working with flowers and leaves and petals. But I have to: I can't edit the materials I work with. My remit is to work with nature as a whole." So it is in the works of these masters that we feel their humanity at work; directly born onto the matrials and canvas of earth. At our goodEarth gallery you'll find images from scandanavian contributors Bente Liebmann and Camilla Noresson that celebrate natures rythms . Their pictorial odes are a gift for our eyes. Have a look at these magnificent underwater caves and watch a video by Bill Stone from TED. Technology has now enabled us to go thousands of meters into the earth to find more beauty. Rachel Sussman is a time traveler. For the last few years, the American photographer has journeyed across the globe on a mission to bring back images of the world's oldest living organisms. In her ongoing project, Sussman has traveled to the primal landscapes of southern Greenland, the timeless high-altitude Andean deserts of South America and even under the ocean. "[The project] is a celebration and record of our past, a call to action now, and also a barometer of our future," she told CNN. Sussman began her time-traveling trips in 2004 while visiting the island of Yakushima in Japan to see a reportedly 2,200-year-old tree. On her return to the U.S., the idea to photograph an example of other long-living ancient species germinated and grew. "It's been a fantastic learning experience and so unexpected," said Sussman. "[These organisms] have never been cataloged in this way; there isn't a global species longevity catalog." They live where many other species couldn't even survive, let alone thrive. Sussman's ancient organisms are continuously living and are genetically identical individuals. So far, she has shot more than 25 different species of plant or organism, each being older than 2,000 years -- "I wanted to start with the idea of 'year zero' " -- with the oldest being actinobacteria from the permafrost of Siberia estimated to be around 500,000 years old. After initial research on the Internet to track her subjects down, Sussman contacted scientists who were studying the species she wanted to photograph. "Nine times out of 10, they're thrilled that someone outside of their field is interested in this esoteric work that they're doing," said Sussman. "Then once the word got out there, people started contacting me." Sussman discovered the llaretta in the Atacama Desert -- a relative of parsley that resembles a large green rock-- from a comment left on her blog after announcing she was going to Chile. 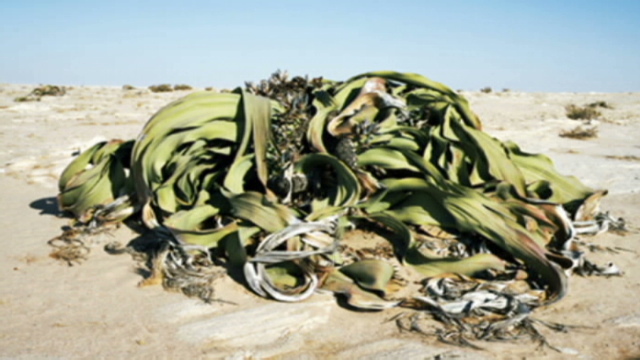 Plants like llaretta or the welwitschia in Namibia live in extreme conditions, a common theme Sussman discovered while tracking her subjects down. "They live where many other species couldn't even survive, let alone thrive." Her next trip will take her to the coast of Spain, where she'll dive to see sea grass estimated to be a mind-blowing 100,000 years old. "That's really one of the most exciting things about this project; you get to encounter these things that are incomprehensible to our sense of time. What does 100,000 years feel like? It's something we can consider for a moment, but hard for us to hold on to it and for it to be meaningful." As well as the metaphysical contemplations evoked by her pictures, there is an environmental message from her work. Many of the organisms she has photographed are not in protected areas or are in places experiencing a potentially damaging change in climate. "It really varies, from really well protected to being not protected at all and having some sense of peril in fact. In some cases like the Siberian bacteria ... it lives in the permafrost. But if the permafrost isn't permanent, it's a climate change issue and it will die. "The welwitschia is in national parkland, but that being said, there are mining companies that actually operate in the park. In the U.S., the clonal Mojave yucca and creosote are on land designated for all-terrain vehicle use. There are fences around them, but you have people out four-wheeling around from LA for the weekend." With 10 more organisms on her list to capture with her lens, Sussman would like international recognition for each of the species she shoots. "Ideally, I would love it if each of the oldest living things could be afforded UNESCO designation. That's actually become a secondary goal that's come out of the project. They really do deserve our attention and protection." Sustainable cork harvesting has been common practice in Portugal for more than 3,000 years. The Rainforest Alliance has certified the Fruticor cork farm as sustainable. The stripping of the bark does not harm the tree in any way and the bark grows back completely, taking on a smoother texture after each harvest. A cork oak tree can be safely harvested up to 20 times during its life cycle, making cork a truly inexhaustible natural resource. Each tree is nurtured from seed and thrives without the use of any chemical herbicides, fertilizers, or irrigation. This method proves beneficial for the plentiful surrounding wildlife, the growing Cork Oaks, and the sustainable products they supply. Mediterranean cork oak forests host a rich diversity of wildlife including Iberian lynx, imperial eagle and Barbary deer. Cork forests are also a vital source of income for many people who sustainably harvest the trees for wine corks. All parts of the cork are used. The best sections are used for bottle stoppers. The rest of the cork is used for composite corks, shoe heels (such as Birkenstocks), flooring, insulation, handles for fishing rods, the nose of the NASA space shuttle, even birdies for badminton. We live in a beautiful world, and enjoying this beauty within the spaces we live is helpful to generate inner peace, ... this is the mandate GoodEarth Canvas. The GoodEarth blog is a place where we can play, share and reflect on the things that inspire and motivate us. We have links to sites about nature, buddhism, spirituality and art. It is a melting pot of influences which deepen our belief that we are blessed to live on this Good Earth. To kick things off, here is a nice video from NHK Japan , showing the earth rise and set from space.